The government’s permission for exiled Bangladeshi writer Taslima Nasreen to stay on in India expired on Monday amidst indications that it is all set to be extended. “The application (of the writer) to extend her residence permit is in the process. If it is extended, extension in such cases is from date of expiry,” a senior home ministry official said adding no final decision has been taken yet. The ministry is said to be awaiting clearance from some security agencies on her plea for extension of the permit. Taslima, 52, living in exile since she left Bangladesh in a cloak of secrecy in 1994 in the wake of threats to her by fundamentalist groups for alleged blasphemy of Islam , was given a one-year visa by the government in 2014 and allowed to stay in India till Monday. Taslima, a citizen of Sweden, has been getting Indian visa on a continuous basis since 2004. She now stays in Delhi. 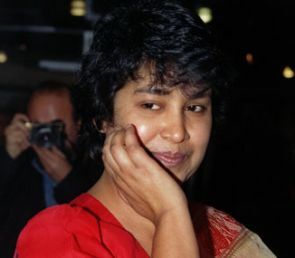 Reacting to the development, Taslima said that this was the first time that her plea for extension of duration of residence permit has not been cleared even on the day of the expiry. She said she went to the Foreigner Regional Registration Office on Monday with her passport certain in the knowledge that her residence permit has been extended but “was stunned when they told me that it is not yet done”. “It has never happened before in the last 11 years. My extension of residence permit used to come well ahead of the expiry of the duration of the previous one. This time too, I had applied for extension a few months ago,” she said. “I’m worried now. Will I be able to stay in India which I have always considered as my second home outside Bangladesh?” Taslima said. The writer said she plans to take an appointment to meet Home Minister Rajnath Singh who had “promised me of giving a much longer-duration visa to stay on in India”. Taslima said she was “yet to totally recover from the fear of having to leave India having been previous bundled out of Kolkata in 2007 and later India for sometime. I have repeatedly got shocks so my fear is still there,” she said. The feminist writer had met Home Minister Rajnath Singh on August 2 last year after India’s decision to grant her 2-month visa. She had been living in exile in the US, Norway, Germany and Sweden and India in the last two decades. However, on many occasions she had expressed her wish to live in India permanently, especially in Kolkata. Taslima said if she is not able to stay on in India she will suffer from an “identity crisis” which will affect her writings and championing the cause of women’s rights.